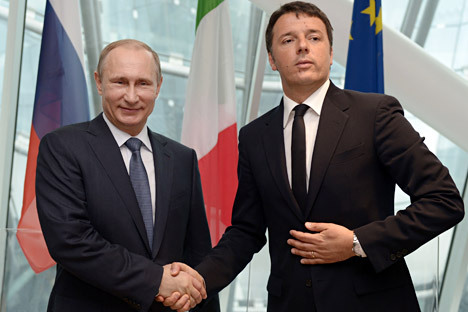 Italian Premier Matteo Renzi with Russian President Vladimir Putin at the end of a press conference at the Expo 2015 in Milan, June 10, 2015. Russian President Vladimir Putin during a telephone conversation with Italy’s Prime Minister Matteo Renzi confirmed Moscow’s readiness to provide the necessary assistance to Rome in its earthquake clean-up operation, the Kremlin press service said in a statement. "The Russian President conveyed his sympathy to the people affected by the earthquake that rocked Central Italy, and confirmed Russia’s readiness to provide all necessary assistance in the clean-up operation," the statement reads. As reported, the two countries’ rescue services have been maintaining close working contacts. A 6.5-magnitude earthquake jolted Central Italy on Oct. 30, hitting the areas already hammered by the previous quakes on Aug. 24 and Oct. 26. It was the strongest earthquake to rattle Italy since 1980. According to Italy’s Civil Protection Agency, no deaths have been reported while around 20 individuals were injured as a result of the disaster. However, once an examination of the structural condition of the dwellings in the affected areas has been completed, the number of people who lost their homes may reach 100,000.